Two years ago I wrote a post on why Norwegian is the easiest language for English speakers to learn. In it I give reasons why this is the case, and it also places Afrikaans as a kind of close second. At the same time, however, Norwegian and Afrikaans are relatively easy to learn in different ways, and since each language student has his or her own style when learning a language Norwegian may feel more natural to one, and Afrikaans to another. This post will look at Afrikaans in greater depth than the other, and also bring Norwegian up for contrast as the other Germanic language English speakers tend to have the easiest time with. - The term "easiest language to learn" is often misunderstood. "Easiest" means easy in comparison to others, and does not mean that learning a language is like learning to ride a bike. Saying that one language is the easiest to learn is like saying that one musical instrument is easier to learn than another, or a type of jet, submarine, or programming language. Claiming that the ukulele is objectively easier to pick up than the sitar does not mean that anyone can become the next Jake Shimabukuro in a week. - Constructed languages (Esperanto, Ido, Occidental...) and English creoles (Tok Pisin, Bislama...) are special cases and are not included here. The former are created with quick learnability in mind, and the latter derive almost all their vocabulary from English (usually over a Melanesian grammar). Now on to Afrikaans. 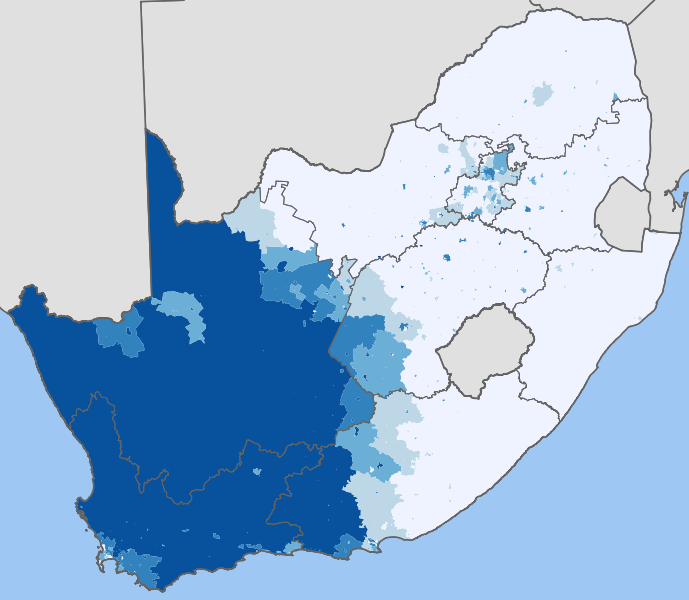 Afrikaans is actually the fourth-most spoken Germanic language after English, German, and Dutch, with an estimated 20 million speakers including second language speakers. Most Afrikaans speakers are found in South Africa and Namibia but a large number of them live abroad too - London has a particularly large number of Afrikaans speakers. It is one of the newest languages in the world, as it is an offshoot of Dutch spoken in southern Africa that simplified over time, acquiring a much more analytic grammar than any of the other Germanic languages, except perhaps English. In light of this, it is an excellent entrance to the Germanic world for an English speaker. 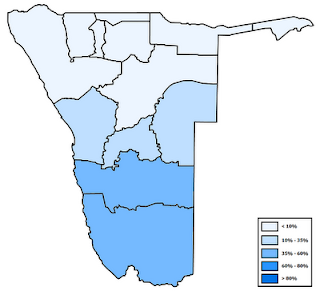 Distribution of Afrikaans in South Africa. 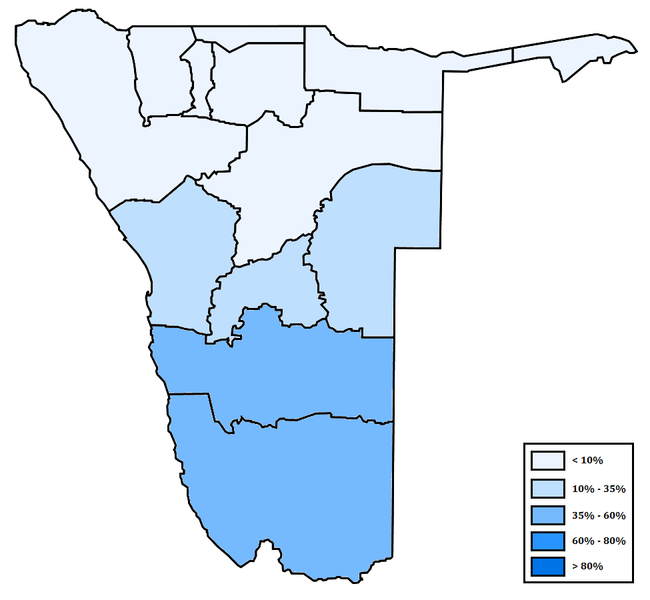 Distribution of Afrikaans in Namibia (bordering South Africa on its northwest). The best quick intro to the language as spoken and written is probably this video, showing the Universal Declaration of Human Rights in Afrikaans. Grammatical gender has disappeared. In the same way that English only uses the single the for the singular and plural, Afrikaans also just uses die. In contrast, every other Germanic language has two or three genders. Dutch has de and het, German has die, der and das. Verb conjugation is almost nonexistent and irregularities are few. The Dutch word to be conjugates as ik ben, jij bent, hij is, wij zijn, jullie zijn, zij zijn. Afrikaans doesn't conjugate at all here: ek is, jy is, hy is, ons is, julle is, hulle is. More on this later, but suffice to say Afrikaans verbs do not conjugate by person. Spelling has been simplified and is more intuitive for an English speaker. -ij has become -y (Dutch mij is Afrikaans my), -tie (English -tion) is written -sie, z which is usually pronounced as the English s in Dutch is written s in Afrikaans (Dutch zon for sun is son), among others. So let's take a look at some Afrikaans from the point of view of the student, and with Norwegian for comparison. Verbs: as mentioned above, verbs in Afrikaans do not conjugate by person. To use a verb in the present tense, take any verb and put a pronoun in front of it. Ek is, hy werk, sy slaap - I am, he works, she sleeps. Norwegian verbs also do not conjugate by person so neither is more difficult here. As with other Germanic languages besides English, the simple present is used where English speakers would use the progressive - "I'm going to school" instead of "I go to school". Ek praat (I talk) becomes Ek het gepraat (I talked). Hy werk (we worked) becomes Hy het gewerk (he worked). One other very important difference between Afrikaans and other Germanic languages is that it has a single past tense, so there is no need to differentiate between "I was" and "I had been", or "I went" and "I had gone". Norwegian on the other hand conjugates in a slightly more complex way, but in a way that resembles English a bit more. While Afrikaans has the het ge-(verb) for the past tense Norwegian usually puts a -te on the end (like English -d or -t), and of course has the perfect tense and a lot of strong verbs. Drikke for drink becomes drakk (drank), gi (give) becomes gav (gave), bli (become) becomes ble (became). Once again, these require some extra memorization but still feel quite natural, and so one student may prefer the feel of Norwegian here while Afrikaans will appeal to another. Ek werk in 'n skool. -- I work in a school. Werk jy in 'n skool? -- Do you work in a school? Ek sal doen. -- I shall (will) go. Along with this Afrikaans has a double negative (like the French "je ne sais pas") that takes a bit of getting used to. Word order is the first tricky part (out of three) for an English student of Afrikaans. In contrast to this, Norwegian word order is almost always the same as in English. "He said that he did it" is Han sa dat han gjorde det (exactly the same word order), and just about the only variation is where a sentence begins with an adverb - Morgen skal jeg jobbe på skolen (I will work at school tomorrow, but word order is "tomorrow shall I work in the-school"). This means that English speakers can rattle off complex sentences in Norwegian without a great deal of thought about word order, while Afrikaans requires more switching around. Adjectives. English is the only Germanic language where adjectives do not decline before a noun. In other Germanic languages, however, an adjective after a noun (predicative) is different than one before a noun (attributive). In practice in Afrikaans it usually means putting an -e at the end of an adjective before a noun. Die kos is smaaklik. -- the food is good. Die smaaklike kos. -- the good food. Die seuntjie is jonk. -- the boy is young. Die jong seuntjie. -- the young boy. Die klere is nuut. -- the clothing is new. Die nuwe klere. -- the new clothing. Dit is reg. -- it is right. Die regte vraag. -- the right question. Some adjectives also do not change before a noun. In contrast to this, Norwegian adjectives inflect in a more regular, but also more complex way. See this page for examples. The student of Afrikaans then will have to watch out for irregular adjectives but will only have to memorize an irregular adjective once, whereas Norwegian requires a bit more work up front but after getting the rules down they become easier to predict. So along with adjectives before nouns, the student of Afrikaans will also have to keep an eye out for irregular plurals. In contrast to this, Norwegian plurals are almost always regular, being formed with the -er suffix (-r if it ends with a vowel). Norwegian does have a few irregularities in the plural though, and since this is somewhat easier to predict if you know the gender of the noun (et- verbs of one syllable don't have a plural for example), once again we have an example of Norwegian requiring a bit more work up front but being more regular later on if you have learned the grammar well enough. Du og jeg er glad for at... (you and I are happy that) --> This sounds like "doo oh(g) yay eah glah for a(t)". In contrast, Afrikaans would say Ek en jy is bly dat... to say the same thing, with no silent consonants. Afrikaans feels a bit more like something you can sink your teeth into, Norwegian is kind of wispy and vague in comparison. Dialects. Norwegian is infamous for being spoken in different ways throughout the country, whereas Afrikaans doesn't vary all that much in comparison. There is also only one written standard for Afrikaans, while Norwegian has bokmål and nynorsk. Resources. Resources for Norwegian are easier to find given its much stronger online presence, while Afrikaans is not the sole official language of any one country and thus doesn't have the full weight of an entire sovereign nation behind it. Both are spoken in countries where almost everybody speaks very good English so they are similar here. On the other hand, it is much easier to find Afrikaans speakers who feel very strongly about protecting their language (somewhat similar to the way Quebecers are fiercely protective of French - some towns in South Africa are modelled after an Afrikaans-only policy) and will very much enjoy teaching it to a student, while Norwegians in general are more relaxed about Norwegian and aren't quite as concerned about how many speak it. After all, Norway is stable and well-off and part of a larger Scandinavian dialect continuum, so Norwegians in general simply learn other languages out of necessity but know in the meantime that their mother tongue isn't in any danger. For the student this means that Norwegian will be a bit harder to use in practice unless you are very stubborn about not using English, whereas if you choose the right location in South Africa you will be able to live in a community that will bend over backwards to help you learn the language to fluency. As you can see, whether one is more difficult than the other is quite hard to say, and since the two languages are spoken on opposite hemispheres it usually isn't hard to pick between one and another. In the end it will come down to personal preference and learning style. Afrikaans is best learned by simply using it and seeing it in practice, while Norwegian is best learned by priming yourself with some basic grammar (not nearly as much as German though), and then using it in practice. So where is the best place to begin learning Afrikaans? This site. Along with grammar and audio samples it also has an extremely extensive number of songs, some of which I think are particularly good. Radio sonder grense has a lot of Afrikaans podcasts here. My favorite is sterre en planete (stars and planets), an astronomy podcast. The largest single resource for text and matching audio by far is the New Testament recorded in Afrikaans. Text for that is here, audio can be streamed or downloaded (600+ MB) from this site. Some other Afrikaans audio can be found on librivox.org, though besides the Universal Declaration of Human Rights (same as the video above) there isn't a great deal else. The Afrikaans Wikipedia is of surprisingly high quality for a Wikipedia of its size, and you can find the longest articles here. Scribd has some assorted reading material in Afrikaans such as this grade 7 textbook. And of course for those willing to pay, there are many Afrikaans textbooks and novels that can be purchased. Other suggestions for good links for students of Afrikaans are welcome.